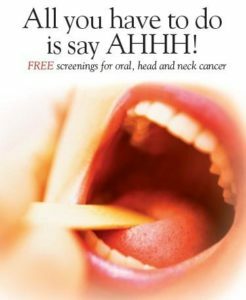 Oral, Head and Neck Screening Intended for individuals age 30-65 who may be experiencing signs and symptoms (i.e. oral pain and soreness, lumps in mouth or neck, bad breath, etc. ), have a history of smoking, drinking or HPV and have never been diagnosed with oral, head or neck cancer. Individuals who neither have been seen. Sweetwater Regional Cancer Center, along with Dr. Tyler Carlson will offer free oral screenings at the White Mountain Dental office to raise awareness of oral, and head/neck cancer and provide a service to the community, providing the opportunity for those without insurance or who have urgent concerns to see a practitioner and be screened. We.